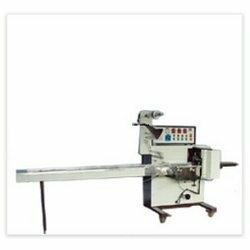 We are manufacturer of automatic flow wrapping machines suitable for packing of biscuits, engineering components, medical equipment, choco-wafer, chocolate bar, noodles, jelly bar, cakes, phone cards, soaps etc. Sealing Type Center seal, Continuous type. Packing Size Pouch Length – 70-300 mm. Packing Width 15-160 mm. Packing Speed Upto 200 pouches/min. (Depends upon product). Power Required 220 VAC, Single phase, 50 Hz., 3 kW. Main Motor 0.50 HP, D.C./A.C. Filling System Manually/ Auto feeder. Optional Attachments Batch coding device. We are looking queries from Haryana, Punjab, Himachal Pradesh and New Delhi. Packaging of Material plays an important role in determining the life of the products and also helps in keeping the products free from various contaminants. We, Engineers consortium, are a leading manufacturer and supplier of Pouch Packaging Machines & Material As Per Customers Requirments in Haryana, Punjab, Delhi and Himanchal Pradesh. Our products are high in demand across industries such as Products (Tea, Coffee, Milk Powder, Spices, Flour, Pulses, Grains, Rice, Shampoo, Ketchup, Water, Wine, Paste, Cream, Oil, etc. ), Packed Food, Pesticides, Engineering Components, etc. We manufacture Vertical Form Fill Seal Machine (Collar Type, Pneumatic Type, Mechanical Model), Automatic Stick Pack Machine, Pouch Sealing Machine, Vertical Pouch Sealing Machine, Horizontal Pouch Sealing Machine, Liquid Packing Machine, FeedingSystems,etc.